February is a wonderful month (if you just ignore the occasional snow storms where I live). It is Black History Month, American Heart Month, and of course, Valentine's Day! I will begin the month by giving you the second star block in my Galaxy of Stars Block of the Month. That happens on the first day (Sunday). I will be giving away one of my 8 Gee's Bend patterns EACH WEEK to one lucky winner. If you want to see what they are, visit my Craftsy site or my Pinterest pages. Then if you win, you can select one of them and I'll send the pdf to you! American Heart Month: works perfectly with Valentine's Day, doesn't it? I will have some free heart patterns, one of which is my Hearts on Fire Quilt from a very popular workshop (and pattern set). Benartex sent me some awesome batiks and I'll have a tutorial on how to make the blocks and give away the pattern for the quilt. 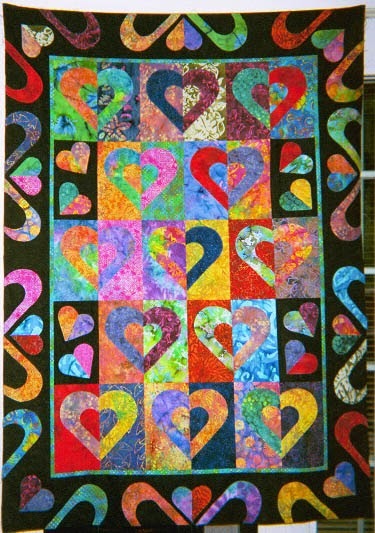 I have a few other heart quilt patterns that I will dig up and whip into shape to feature here, also. I may have a few other surprises; you never know. 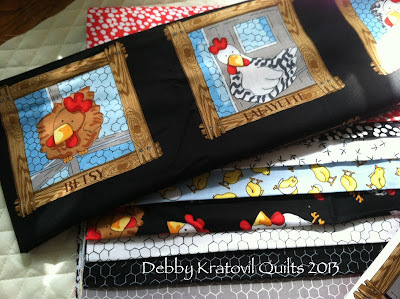 I am part of Day 5 in the Novelty Prints Blog Hop over at the Sew in Love with Fabric blog. Sometimes you see a great set of novelty prints and know exactly who you will make something for. 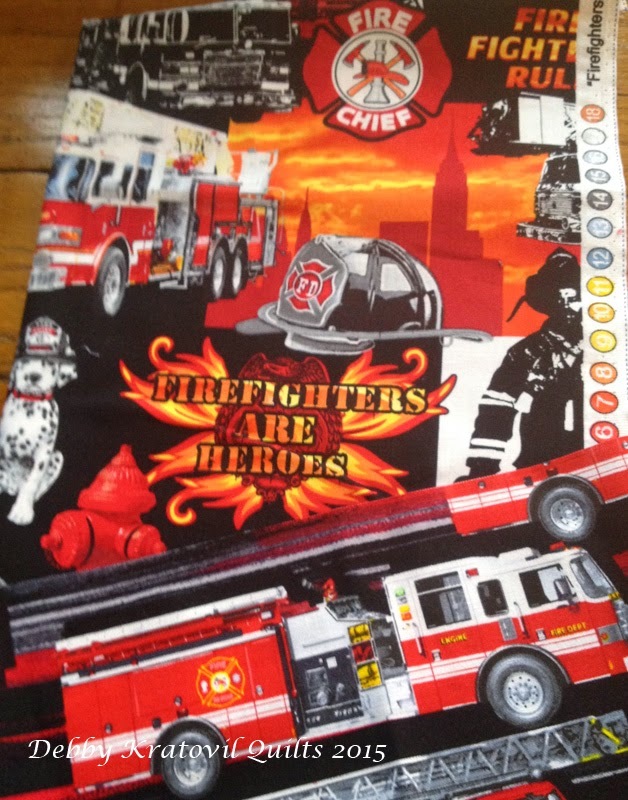 I'm sharing how I used some wonderful police and firemen fabrics to make a few things for my little grandsons, who are 2 and 4 years old. This is all I have left of the Firefighters Rock Collection. But you can see all the awesome images from a mascot dalmatian wearing a fire hat to a huge fire engine and even a red fire hydrant! Let's not forget our policemen. 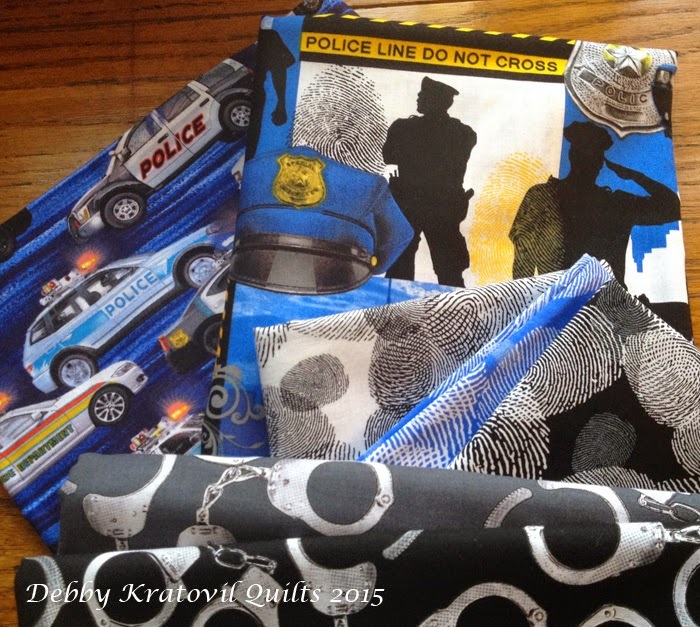 Can you believe there is handcuff fabric and fingerprint fabric? This was fun to work with. 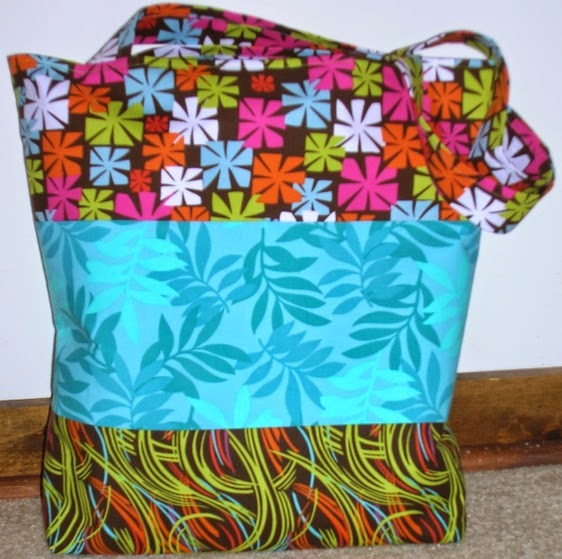 Head on over to Sew in Love with Fabric to see what I made. Lots of pictures! 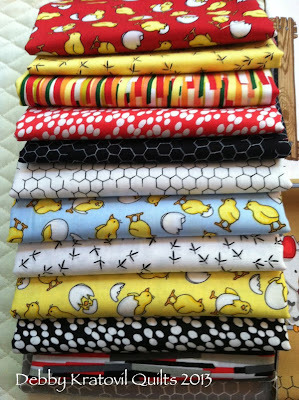 Do you remember the Mambo Collection from Windham Fabrics? The one you should wear sunglasses to view? And the FREE tote bag pattern I shared a few days ago using the collection? 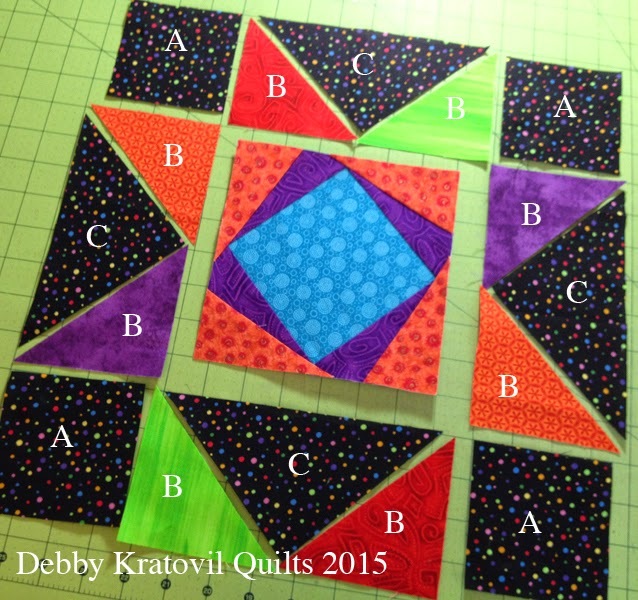 Well, here is the pattern for that psychedelic Heat Waves quilt . . .
Heat Waves: 56" x 62"
I don't have a picture of the finished quilt. This was in 2007 before I had a camera phone. Remember how we had little cameras that had FILM in them and we had to take them to the local camera shop to get them developed? I thought it was radical to get a CD with all the photos! Wow - to get them onto my computer that way was so 21rst century. I digress. Here is a multi-page pattern with illustrations and assembly diagrams. Use your own fabrics and play around with the line drawing. The template is included. The center melon shape is appliqued under the larger melon shape, trimmed and then the large, two color shape is raw edge appliqued to the blue background squares and rectangles. Fun playing with color! Heat Waves Pattern - enjoy! 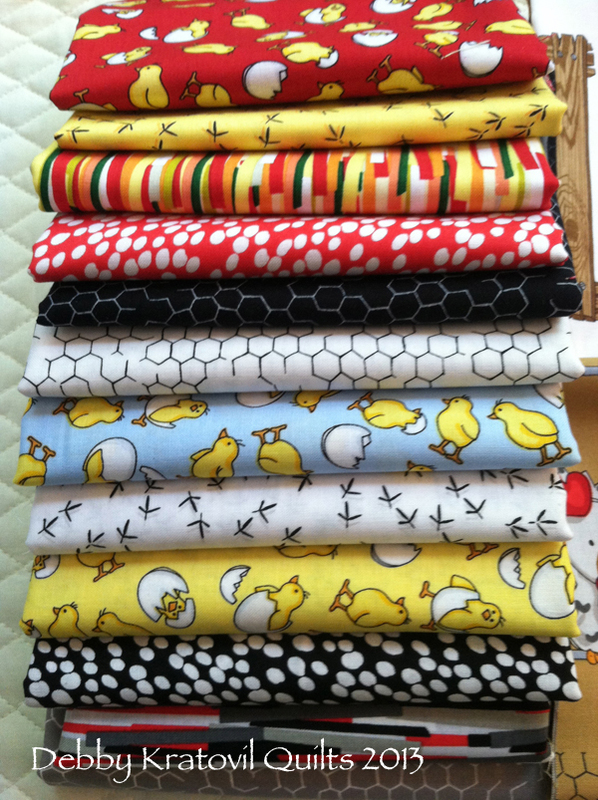 Seven years ago I was sent this awesome - and very BUSY - fabric collection by Windham Fabrics called Mambo. Quite the colorful and challenging set of prints. At that time I was developing my EZ Double Wedding Ring pattern (actually it had been 5 years by that time) and decided to do something really funky with it. Are you ready? Go get your sunglasses!! I called it "Heat Waves." I had it quilted and not sure what Windham did with it. Probably bagged it up in a dark room or shipped off to a sunny beach somewhere. Sipping margaritas with other colorful fabric. Let me tell you a little bit about this before we go to the FREE PATTERN (no, this is not it - whew!! I know you say). No, wait a minute. I'll be right back . . . I'm back! I just discovered I HAD written the pattern with art and template for the quilt above. It's still on my computer. I'll share that later this week (that's if you want a psychedelic quilt!) Windham never published it, but I'm sure you can find some calm fabrics to create this. It's all raw edge applique. More later. Here's the free pattern project. I call it the 5-6-7 Tote Bag (because of the width of strips used). 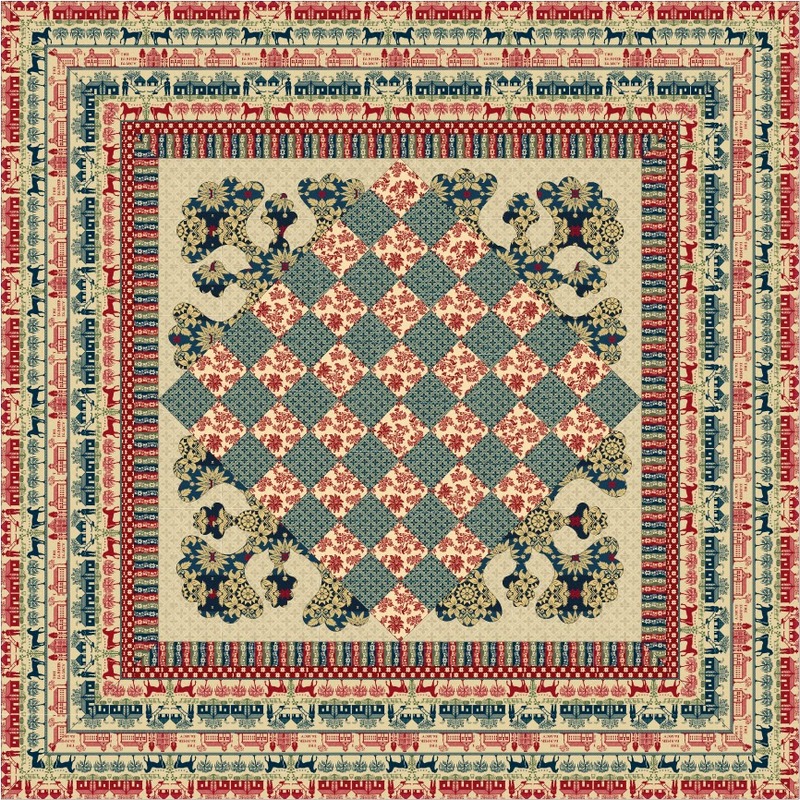 It's a free download at the Windham Fabrics web site (link above). The bag is 15" high (before handles) and 16" wide. A great size for ANY fabrics. I might even make it again (not with those fabrics). I actually have a 3rd project I just pulled out that uses 10.5" squares. 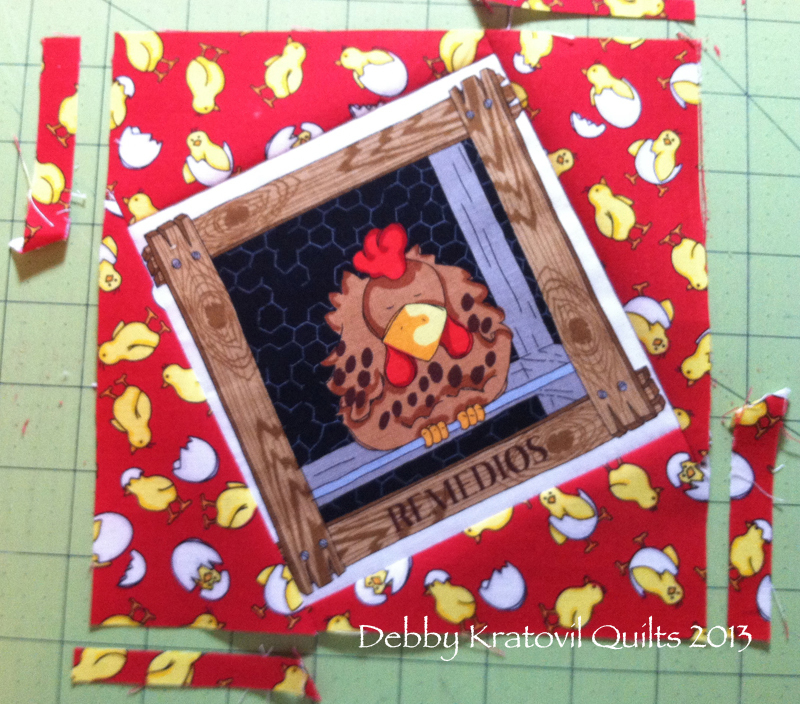 I had cut up every remaining piece of this collection into 10.5" squares and used an awesome template set created by my friend and fellow teacher, Nelly Vileikis. I will blog about that soon, too. I took pictures this afternoon (Sunday) and I'm sewing a few more blocks. Hope you enjoyed seeing what is actually possible with wild and crazy fabrics. 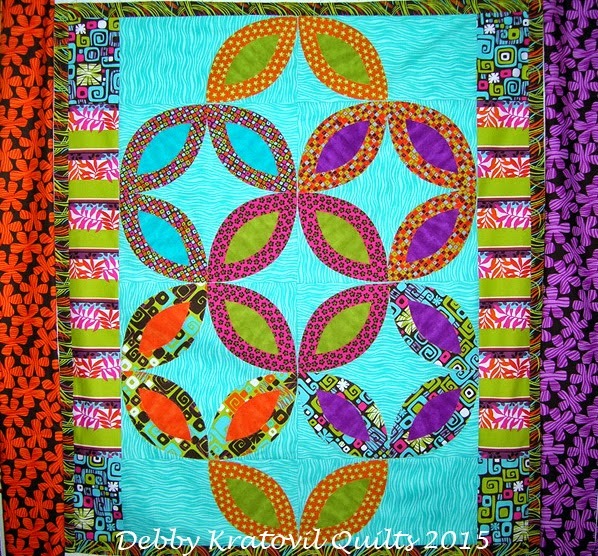 I love sewing with bold color and design. It makes me happy. Come back on Wednesday (January 21) for my Windham Wednesday post using the Broken Stripes Collection (remember this?) 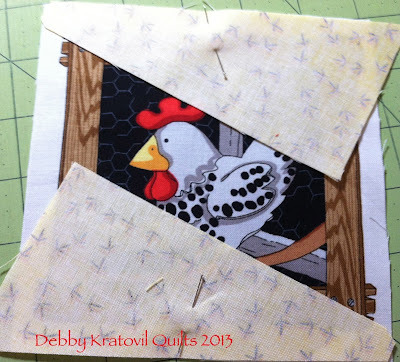 I have a fun tutorial using these with a very traditional block. See you then! 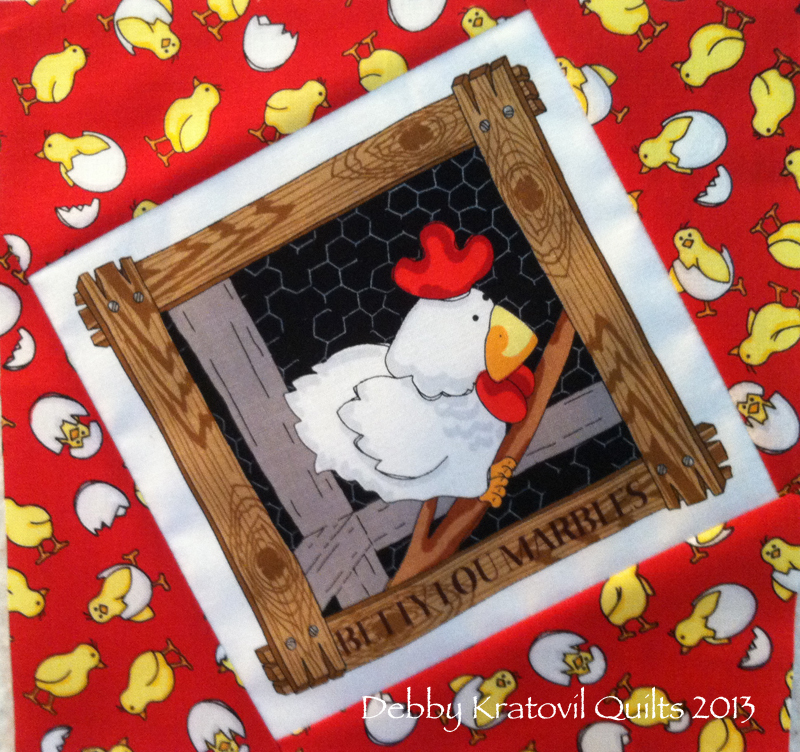 Did you miss Wednesday's FREE PATTERN and my ode to my stolen quilts? Sigh. Gone but not forgotten. Go back and check it out if you like free patterns that cater to a lot of color! I am back to my Windham Wednesday's posts and wanted to give you a heads up on the fabulous collection I will be featuring. This will be next Wednesday, January 21. I will show a quilt I made for Fall Quilt Market that is now a new class. I will also show a traditional block gone modern and my steps for making it. And, of course, I will have the block pattern so you can try your hand at it. 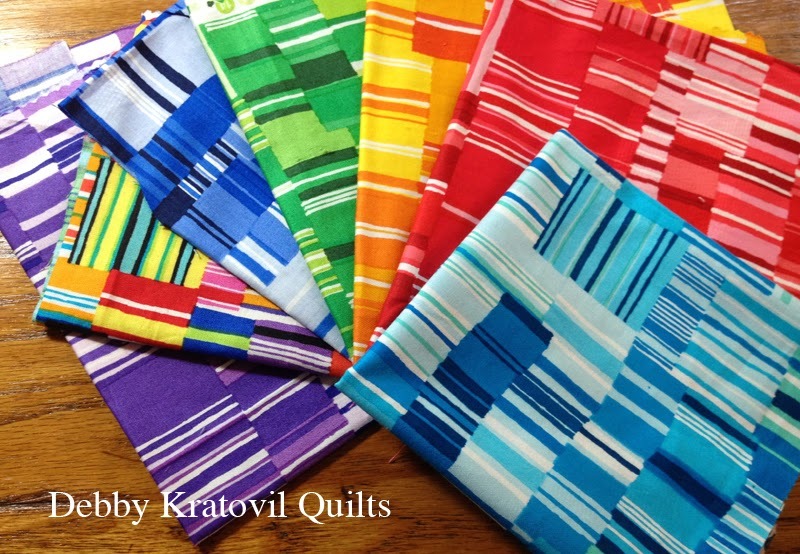 Yes, I was able to make not one, but two small quilts using this amazing collection of bright stripes. If you are a follower and receive email updates or in your blog feed, you will be notified. In the meantime, have a super weekend and I hope you get some sewing in. Ten years ago this month I had a suitcase of 30 (GASP! ), yes THIRTY quilts stolen while on a teaching trip to California. Never a one showed up, but I try to think of it this way: they are hanging on the giant quilt rack in the sky, right? Anyway, I was thinking about Velvet Stars today and thought: this would make a NICE FREE PATTERN! Then "she" would look down on me gently from her starry perch and thank me for remembering her. Velvet Stars, 48" x 62"
The block is 12" x 12". 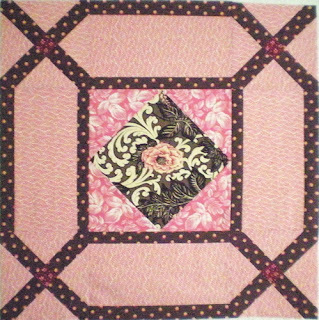 This comes from my first quilt book: Bold, Black and Beautiful Quilts, AQS 2004. 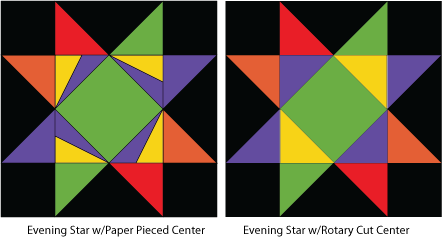 The pattern is a multi-page pdf and includes templates, though I'm sure you can use the stitch-and-flip method using a rectangle and square to get those star points. Join me, won't you, in a remembrance party for Velvet Stars! Select your brightest prints or even work it up in black and red. She's a star worth the time and I know you'll enjoy the celestial ride! I have always been in awe of the Amish quilts and their use of solid fabrics and traditional patterns. When I created the Gee's Bend patterns for Windham Fabrics I had a lot of their hand dyed solids left over. 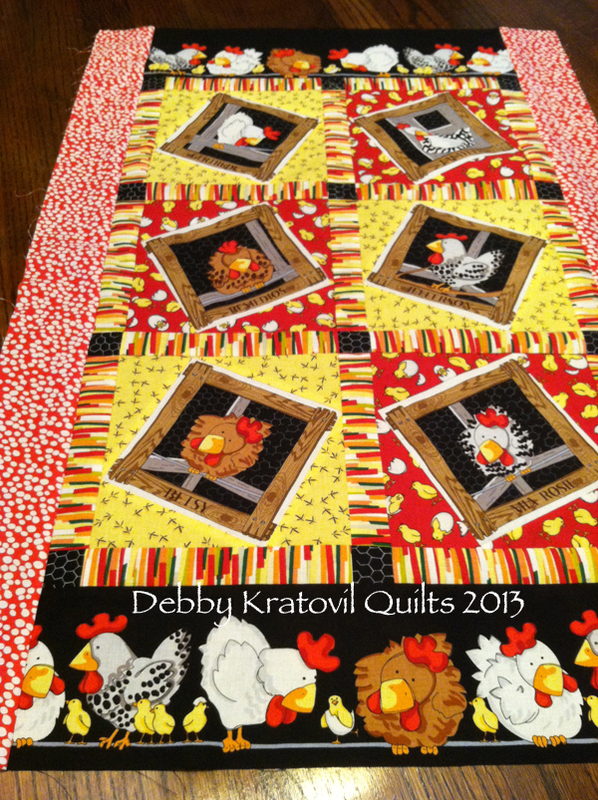 I created two timeless quilts, one of which is the classic shadows pattern. 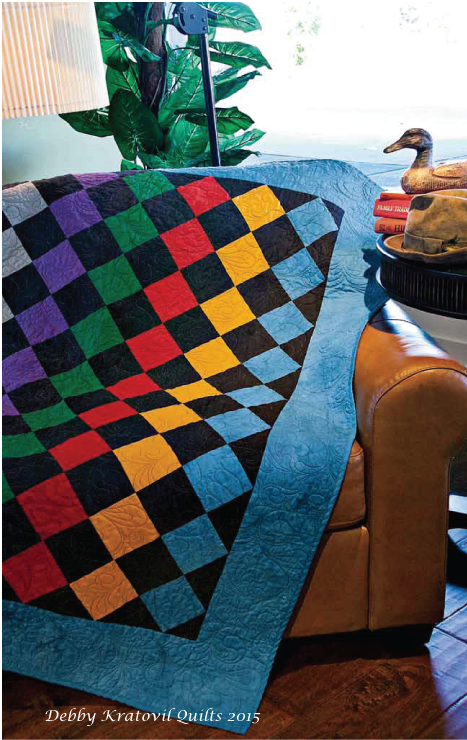 Classic Amish Shadows: 52" x 63"
Simple squares of color alternating with simple squares of black. And all set on point. I could make this quilt again and enjoy it just as much. 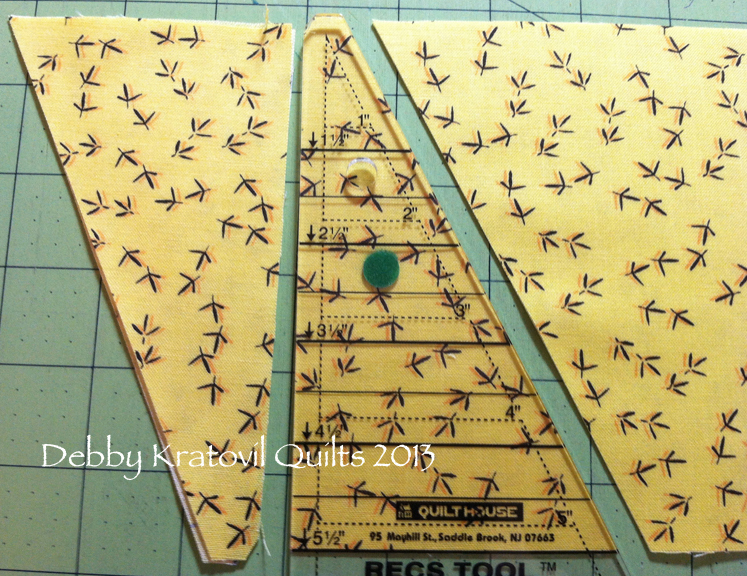 My faithful friend and longarm quilter, Connie Gallant, gave it an all over design to soften the strong linear feel. 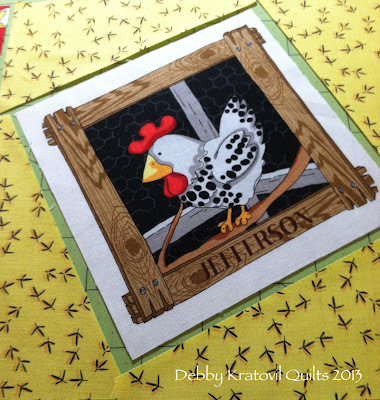 Funny things are happening in the Hen House! Fowl Play by Kanvas is a fun collection I used last year for Benartex and their blog. These fabrics are based on a real life urban chicken farm (the names of the chickens are real! 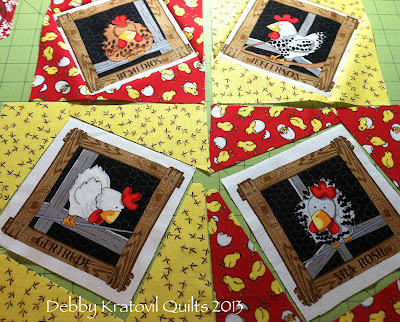 ), so that really gives personality to the whimsical prints of chicks, hens, chicken wire and even chicken scratching! NOTE: While you may not be able to find this fabric in your local quilt shop, this pattern works with ANY 5-1/2" square: a beautiful flower, a novelty print, etc. Q: Debby, why did you choose this particular collection to work with? A: How could I not? I absolutely love bright prints with good contrast. And I so enjoy the challenge of working with panels and fussy cutting motifs so they get center stage. Those panels of chickens have actual names of real birds from a real farm. How could I resist? Q: How did you decide on a project? 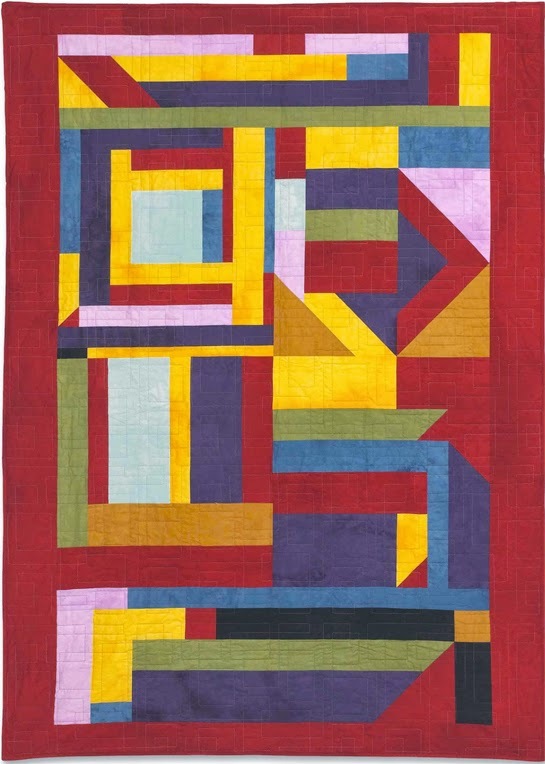 What is your process for making a set of blocks into a quilt or other project? A: I always listen to the fabrics. Once they come into my home and I've folded and stacked them, they begin to get comfortable enough to start giving me ideas. Like I said, I always love the challenge of working with panel prints. I love to get them centered into a block, but not a boring block. The block I share today is my Tilt Block. I began making this around 2001 when I bought Darlene Zimmerman's Tri Recs tools. Rather than bore you with words, let my photos do the talking. 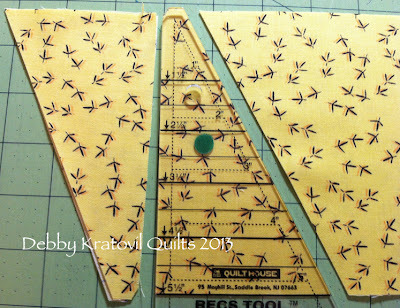 Why did I use the Tri Recs tool and not just cut over-sized squares or triangles? Because using this type of triangle, the outside edges of all four sides stay on the straight of grain. NO BIAS EDGES. The angle of the Tri Recs tool is about 57-1/2 degrees (I think), so I had to guess the height of the triangle to use to "tilt" my block. Not to worry; because we will eventually shave a little off the overhanging edges and this will be fine. 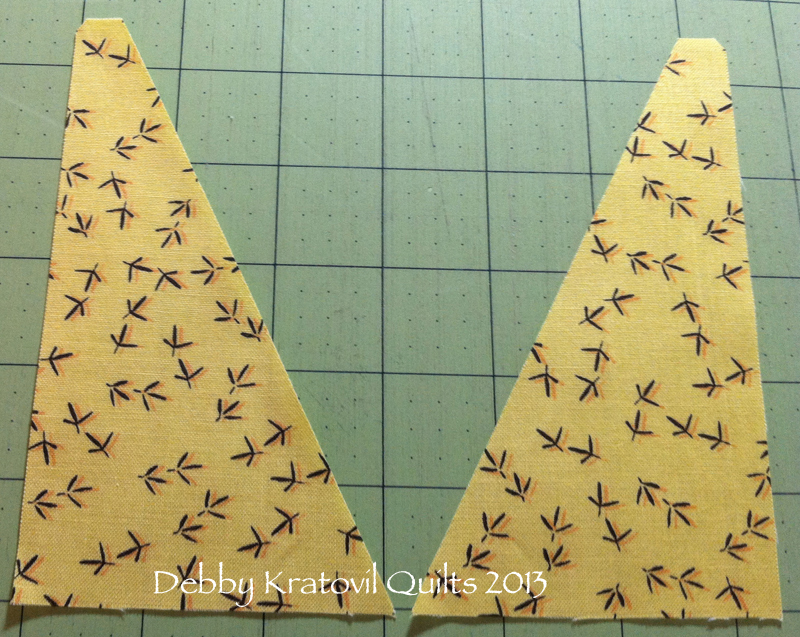 When the fabric is on the fold, you will get mirror image triangles. I will use only the triangle on the left in the picture above. You can't mix these two mirror image triangles in one block. I fussy cut the panels into 5-1/2" squares. Then I audition my triangles to make sure I've got them in the right position. You can use ANY 5-1/2" square - fussy cut a beautiful flower! The two sets of triangles I will use for my two blocks. For the red block to tilt in the opposite direction, I use triangles that are the mirror image of the yellow ones. Pin a triangle to two opposing sides. Sew with 1/4" seam. Press AWAY from the center. 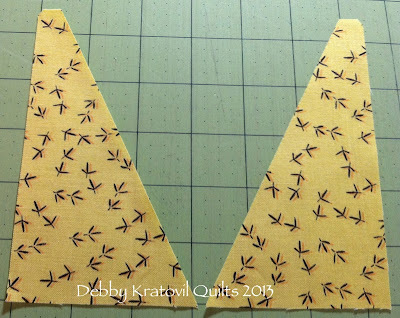 Sew and trim; ALL the outside edges are on the straight of grain. NO BIAS! And can we see several blocks together? Press toward the sashings and the seams will nestle in opposite directions for a perfect match. PARTY TIME IN THE HEN HOUSE! Here are the fabric requirements to make this simple runner. I let the fabric do all the work. That's what they told me they wanted to do and I just followed their directions. 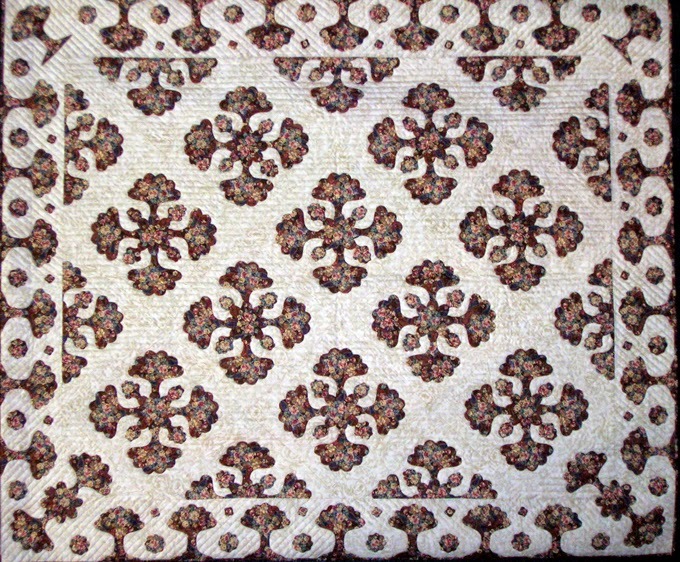 Block Size: 6-3/4" x 6-3/4"
Runner Size: 22" x 33"
One strip of 6 panels with white background (6205-09) OR 6 squares cut 5-1/2" x 5-1/2"
And here's a tutorial using some Windham Fabrics from designer Nancy Gere. 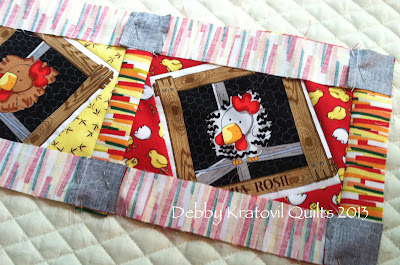 I have step by step pictures on how to make those criss-cross corner blocks using NO TEMPLATES. Can you believe it? Oh, and did you know that I've started a new Pinterest Board on my tutorials? I'm playing catchup, but I do have 14 links there! I have used this block pattern in my Block a Day calendars. I love the symmetry of the blocks, don't you? And I also love applique - when I can do it using my sewing machine! The pattern is written for both hand and machine applique. You can have it by clicking on the link below. Here is how it looks in the pattern (a purely digital version, though I do have the Farmer Fancy Coverlets Collection). Someday I may make it . 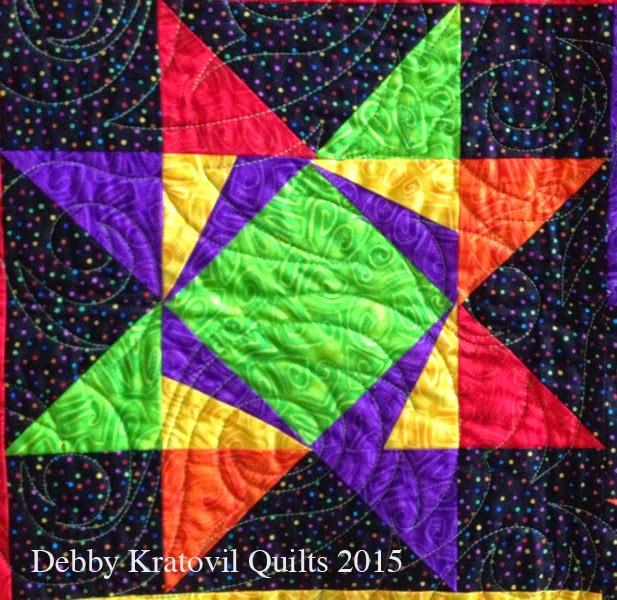 . .
Constitution Oak Quilt: 64" x 64"
WELCOME to my 2015 Galaxy of Stars Block of the Month FREE program. 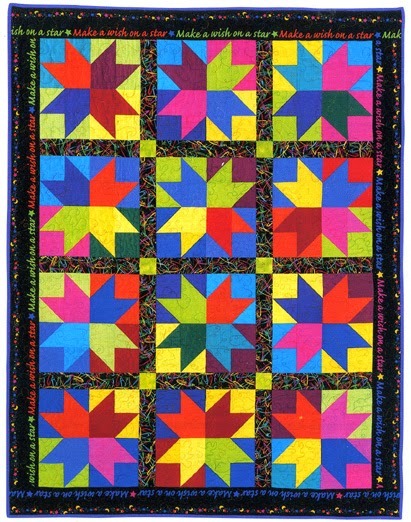 I designed this quilt as a Block of the Month program for Intown Quilters (Atlanta, Georgia) in 2006. 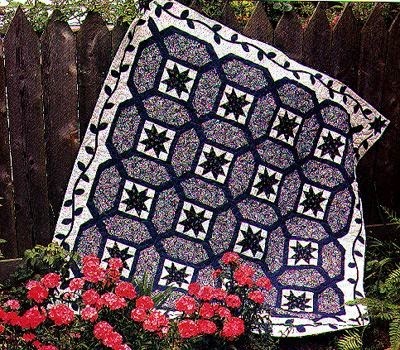 It also appeared in Quilt Magazine in the November/December 2006 issue. 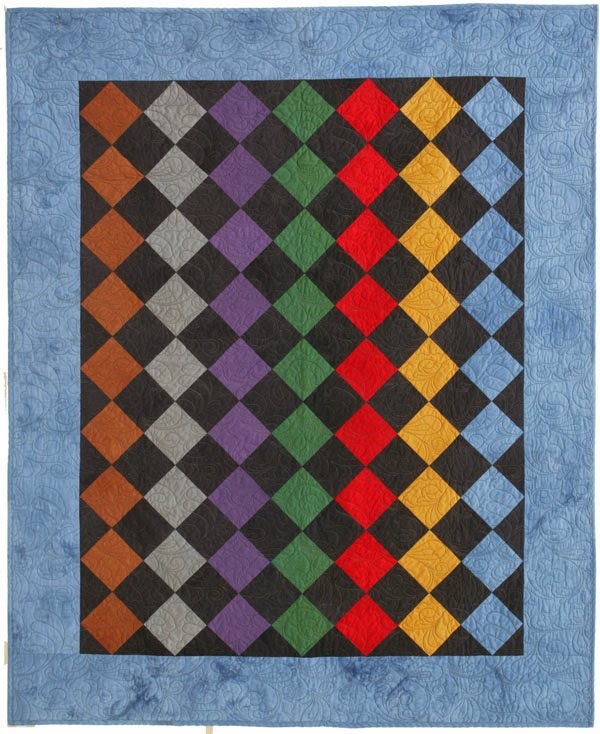 Now you can enjoy the beauty of this quilt for yourself, making it in the colors of your choice! And it's FREE! As a Block of the Month, in order to be notified when each block is rolled out, you will need to sign up via email or to follow using Bloglovin (see my sidebar). I PROMISE I won't bug you about things, try to sell you stuff, or otherwise harass you. My blog is NOT a business (do you see any of those flashing, annoying ads?). Here are some parts I dug out from my teaching box, and as you can see, I have to change the center unit colors because I don't want the oranges to touch. (That means I have to remake it!) But for now, it helps you see the rows. OH, NO! I twisted the bottom row and just noticed it. Too bad! I'm done with the photography. I think you get the picture, right? One VERY IMPORTANT word of advice: It is imperative that you pay attention to your 1/4" seam allowance. If you're unsure about it, take some strips of fabric and practice. If the block doesn't come out to 12-1/2" x 12-1/2" unfinished, it's an issue of your 1/4" seams, I promise! 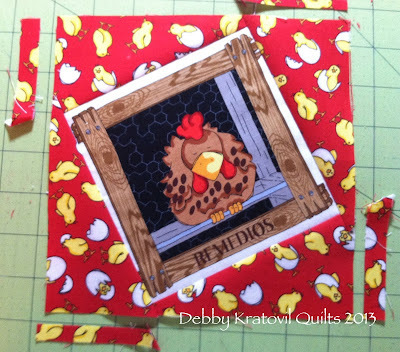 And here's the block from the quilt . . .
See you next month! Remember, in order to be notified, you need to sign up either via email or to follow via Bloglovin (over on the right sidebar). Thanks for joining me.